According to a BBC article today, microbes taken from the cliffs of Beer -- a small fishing village in the UK (I know, sorry) -- were left outside of the ISS for a year and a half to see how well they could live in the harsh conditions of space. When the astronauts finally retrieved them, they found that many of the microbes were still alive and well (click for a video). Bacteria has survived in space for several years before, but this is the longest (known) that any photosynthesizing microbes have survived. Interestingly, the microbes weren't selected for any special properties. 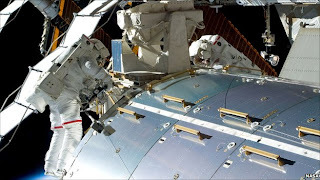 The researchers in charge of the experiment guessed that if they sent extremophiles outside for this mission, they would do fine with the intense UV radiation and large temperature swings. So instead they just sent the community of rather ordinary tiny creatures that happened to be living on this rock already. Once examined back on earth, the researchers found that the survivors had thick cell walls and were similar to species known to live in Antarctica as well as hot desert climes. The group suspects such a correlation might mean they have a strong ability to repair their DNA. "The experiment is part of a quest to find microbes that could be useful to future astronauts who venture beyond low-Earth orbit to explore the rest of the Solar System." Outside of the applications for exploration the researchers in charge cite, the study has some serious implications for panspermia, the controversial theory explored by astronomer Fred Hoyle (who also named the big bang) as well as Carl Sagan. The theory holds that living things could have traveled on space rocks from other worlds to seed life on earth.